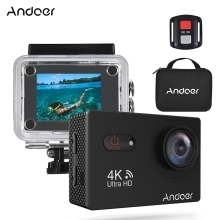 Andoer AN9000R 4K action camera shots stunning video and high definition photos for your journey! The 2inch touchscreen makes it easy to operate. You can enjoy more fun with the Time Lapse Video, Slow Motion and Drama Photo modes. It also supports WiFi smartphone for real-time photo share. The package comes with a 40m waterproof housing, a wearable remote control, various mounting accessories and a hard case. Support 4K 25fps/ 1080P 60fps/ 720P 120fps stunning video recording, the image can be rotated. 2inch touchscreen for easy operation and real-time monitor; 4X digital zoom help to magnify scene from remote. The camera housing waterproof 40m, great for diving/swimming & etc water activities. Compact and small, with multiple mounting accessories and a portable hard case. Item Size: 6 * 4 * 2.3cm / 2.4 * 1.6 * 0.9"
Package Size: 21 * 17 * 6.5cm / 8.3 * 6.7 * 2.6"